Sometimes the hardest thing for any of us is finding the right balance of healthy and great tasting food. I have tried many vegetarian and vegan cookbooks over the years and I will freely admit, some of them were horrifying. I still remember spending over two hours on a dish that looked like mush and tasted even worse (and it looked just like the picture!). For this reason, I am always reluctant to try vegetarian and vegan cookbooks unless I see they are highly rated and have been tried out previously. Recently, I was approached to review Vegan for Fun, a very popular vegan cookbook from Germany. After reading some of was said online, however, I couldn’t wait to dig into my digital copy of this cookbook! Looking for a vegan cookbook that is filled with healthy recipes and designed for just about anyone? If so, we think you will love Vegan for Fun. This German cookbook has been taking the world by storm, with actors, star, and athletes all over the world adapting it to their own lifestyle and going vegan. Attilda Hildmann, after seeing his father die early of diet related issues, decided to change the way he lived by getting off the couch and changing his life. By switching to a vegan diet and exercising, he lost over 65 pounds, becoming healthier and finding he had more energy. He believes that vegan food should be delicious and appealing, using only the best ingredients to help us rethink how we view food. With a diet low in fat and cholesterol free, everyone can enjoy delicious meals without feeling guilty about using animal products and what we are putting in our bodies. As someone who isn’t vegan herself, I have to say that this cookbook sounds amazing. I can only think of two recipes in the entire cookbook I wouldn’t make, and that is due to my husband’s pure hatred of mushrooms (I will just make them when he isn’t home – hehe). All the recipes look appealing, use simple ingredients, and are very easy to make, making them perfect for just about any lifestyle. While the book is designed for vegans, it really is the perfect book for just about anyone who wants to add healthier meals to their weekly meal plan. Based on my own experience with this book, I am happy to give Vegan for Fun an A rating. Want to try this cookbook yourself? You can purchase Vegan for Fun on Amazon.com for $25.82 or $9.99 in the Kindle format. Would you like to own this awesome cookbook? 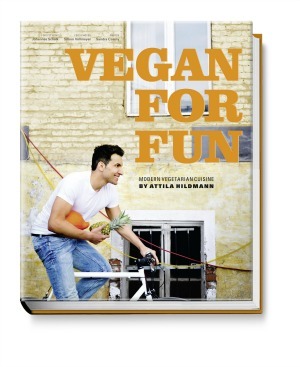 We are excited to be giving away a copy of Vegan for Fun by Attila Hildmann in your choice of format (digital pdf or paperback). To learn more, make sure to read the rules below and then enter through the Rafflecopter. One lucky reader will win a copy of Vegan for Fun. Sweepstakes ends May 5th at 11:59pm ET. I am a non-meat eater and trying hard to go vegan altogether. My husband, however, thinks that meat is a “necessity.” I so need some good recipes to prove him wrong and this sounds like a great resource for me – I’d love to win it! I’d love to win the book because I’m looking to incorporate more meat free meals into our life. I love looking at cookbooks to get new ideas for dinner. Thanks for the giveaway! I’ve been a non meat eater for 16 years, and I’m ready to go vegan. I just don’t know how to cut out cheese & sour cream. I do use soy sour cream when I can get it but few stores have it where I live, it’s a rural area and it’s at least 20 miles one way to any store that sells produce and soy products. Maybe this book could help me take the next step. It really is great. I have seriously considered going vegetarian more than once – I LOVE veggies! I am a vegan and my partner is a vegetarian, so we are always looking for awesome new books to try! I use Pinterest a lot these days but would never turn down a recommendation for a book full of tasty (healthy) new recipes! Thanks for the chance to win. Why would I like to win this great cookbook? Well, because being totally vegan has been my goal for a while now, but I never seem to be able to succeed 100% of the time. I grow a lot of my own veggies and love to cook, but I really need more FUN ideas! Been trying to incorporate better foods into my Family’s diet. This book would be perfect for variety. Well, thanks for the opportunity! I would love to have a good recipe book for vegans. This would be useful, in order to make meals for vegans as well as other house guests. I am a partial Vegan and this looks very interesting. Love the content of your posts. I am a vegetarian and I would love to have this cookbook. I need new recipes and inspiration. I thank you for the chance to win. I have some family members that dont eat meat so I am always looking for things to make when we have our cookouts and parties. I dont want to feel left out food wise. I’ve been mostly vegan since my daughter was diagnosed with dairy allergies. I would like recipes that aren’t too complicated. Vegan for Fun sounds like a start in the right direction. Thanks for the giveaway! I have tried some vegan recipes both at home and at health food restaurants/cafes and I’m really intrigued by the lifestyle. I don’t think I could go 100% vegan but I’d like to incorporate more vegan food in my diet. I would love to win this cookbook because I am lactose intolerant and would love delicious vegan recipes to eat more often. I actually keep threatening to go vegan one day a week but I haven’t done it yet. I love vegan dishes. I have wanted more recipes so this would be great. Thanks. I have a friend and his entire family is vegan kids included this would be perfect for them. I want to win this book so that I can learn more about being vegan! I’ve been trying to be vegan off and on for years now. Its not fun, so maybe this book would help. I am already vegetarian but would love to have some vegan alternatives. This cookbook would be a great start! I’m from Germany. Attila is a big catch for us all! Love his cookbooks! I want to become Vegan, and this book seems like the perfect start, because eating should be fun. Right? I would like to make healthier meals. I’ve heard of things like meatless Mondays but I wouldn’t mind implementing other days of the week, even if they don’t rhyme. My fiance loves to cook. We will try almost everything once. I’ve been vegan for three years and I’ve tried a lot of food and recipes that are really yummy. I’d like to have this book because I can never have too many new yummy sounding recipes to try. My sister in law is Vegan, I think she would love it. I would love to read this. I just ordered a juicer yesterday and want to eat healthier. possibly ditching dairy and meat for good.I just hope I can stick with it. I want to win this book for my mother in law. She has had a serious illness and her doctor told her a vegan diet would be good for her. My family is vegan, we chose the lifestyle to be healthier. This book seems interesting. I would love to have some great vegan recipes. I want to eat healthy because I have had cancer. My friend is opening a school that will be vegan. I think this would be great when she is making lunch for the kids.